Initially, Dr. Konrad Spindler from the Institute for Primeval and Early History estimated the entire find dated back to the Bronze Age due to the axe he examined. 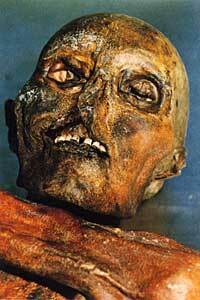 Since its excavation the preceeding day, the mummy had thawed out to a temperature of 18°C. That evening, the Iceman was transferred to the Institute of Anatomy and stored in a refrigeration chamber at -6°C with a humidity of 98%, simulating the conditions on the glacier. For the first time in history, medical and archaeological anatomical studies could be carried out on a corpse dating back to the 4th millennium B.C. The Iceman's body is practically intact, with the exception of the left hip area that was inadvertantly damaged during the rescue. Due to its position on the rock, the Iceman's face is slightly squashed. An examination of the gender of the mummy revealed it to be male. 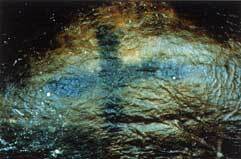 All of Iceman's hair had fallen out in the process of mummification, but human hair was found on his clothing. The longest of the preserved hair measured 9 cm and was dark brown to black in color. Examination of the Iceman's hair revealed that he must have come into contact with copper ore processing. The mummy's finger and toenails had fallen out, but one fingernail was recovered at the site. Examination of the fingernail revealed that the Iceman had suffered from stress months before he died. A dental exam showed a missing tooth in the upper jaw, a lack of signs of wisdom teeth, and no cavities. His teeth were noticeably worn down through chewing, possibly by eating grain contaminated with quartz dust from stone mills. 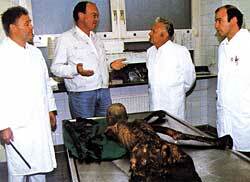 The contents of Iceman's stomach and large intestinewere analyzed at the Botanical Institute of the University of Innsbruck. The results showed his last meal consisted of a gruel made of einkorn, meat and unidentifiable plants. The discovery of a sloe proves that the Iceman supplemented his diet with berries. 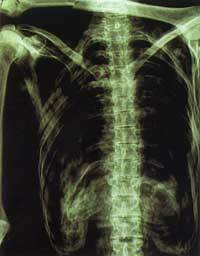 Analysis of the mummy's large intestine showed that Iceman had suffered from nematodes when he was alive. 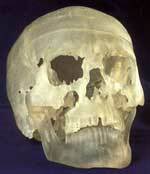 To establish the age of the mummy, a small cylinder of bone was taken from his left thigh. The age-related signs of wear and xrays determined that the Iceman was between 40 and 53 years of age at the time of his death. Averaged to age 46, the Iceman had reached an advanced age by Neolithic standards. At the time of the discovery, marks on the mummy's back were thought to be brandings, but it was later established that the marks were tattoos. In prehistoric times, tattooing was done for various reasons, however, it is thought that they were mainly used for medicinal purposes. The Iceman's tattoos are concentrated in the lumber region, and on the knee and ankle joints. 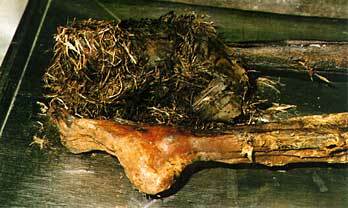 Following the unique discovery of the Iceman, bone particles and fibrous tissue were taken from the left hip and subjected to carbon-14 dating. Fragments of the grass stalks of his cloak were also tested. 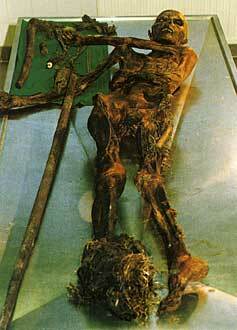 Data from samples examined in various laboratories determined that Iceman lived between 3350 and 3100 B.C.